My sad heart turned to anger when I figured out why… mice had invaded. I always thought bees would sting them away, but I suppose they were overwhelmed. When I opened the hive to do a check, there were NO bees. Well, maybe a dozen were starved, but everyone else was gone, and so was their honey. Nooo, I mean their HONEYCOMB was gone. Holes were eaten in the comb. There was nothing left for them to eat. Hopefully, they swarmed, leaving the (*&^%$%^^ mice to their hive, and they found somewhere else to go. That’s what I *want* to believe happened, but if they did, it’s a tough time of year to swarm. It’s been pretty cold, down to 22˚ the other night… and there really aren’t *that* many flowers out. There are plenty of places to hide in the junk pile, so maybe I’ll notice them when it warms back up and I can go looking. I have a call into Bryant Honey and I’m keeping fingers crossed that Don can provide me with some more bees. His are what I had in my Golden Mean Hive, they were nice last summer and are doing ok, although the mice got in there too. 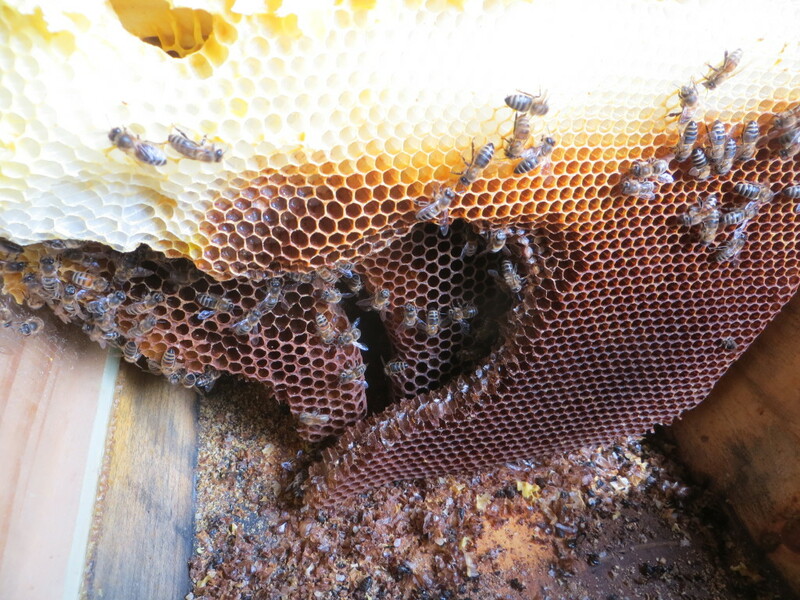 (The photo is of my Golden Mean Hive) I caught it in time and provided the bees food in their hive to keep them happy in there. They have some larvae, not a lot, but some, so maybe, they’ll stay! I was on the verge of buying or making another top bar hive (just in case)… like if I saw a swarm, or just *because*. Now, back to just one hive, the rush isn’t there. It still is on my slate… I’d like to try to build one, although I *KNOW ABSOLUTELY* it won’t be as gorgeous as my Golden Mean Hive I bought from backyardhive.com, see my affiliate link on the sidebar. Wish me GOOD luck, I’ve had enough Bad with my hives! If you’re curious about more bee “stories”, just go to the top of the page and click on the BEES tab. You’ll find all my posts about bees, videos included! So very sorry this tragedy happened… darn mice… I know you especially will overcome this but wish you didn’t have to… wishing you Bee Blessings…. I am so sorry to hear this. You work so hard to keep your bees going. I know some day you are going to have the hives that you want. Seems like nothing can ever be easy. Probably should replace the cat, too. So sad and frustrating after ALL your hard work to make the nice little barn for the bees. I am so sorry about this. It must be discouraging, but you seem to be keeping it in perspective as you keep going to continue to mouse-proof the bee barn. Good luck! So sad. For the bees and you. It so discouraging to work so hard and then have everything trashed (damn mice) Good luck with the remaining hive. Ohhhhh so sorry to hear about your bees. Maybe they are hiding nearby. Oh, man! What a disaster! Hope they escaped to safer quarters elsewhere.